Encompassed within the "Southside" is the area of Jacksonville between I-95 all the way east to the Intracoastal Waterway. Zip codes 32246 and 32224 are located in the Southside area. 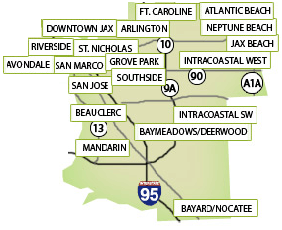 Southside is the hub of Jacksonville with the most popular shopping areas and nightlife Jacksonville has to offer. In fact, this area has probably the most restaurants, shopping centers, and office space in all of Jacksonville. Two of Jacksonville's newest shopping malls, the Avenues Mall and the newer St. Johns Town Center, are located in this part of town. In addition, you have the Cinemark Tinseltown area, a megcomplex movie theater surrounded by some of the most popular restaurants and night life enterntainment in Jacksonville. Housing in Southside includes many condominiums and multifamily homes. These range from apartment conversions to new upscale, amenity rich construction. Cost for single family homes range from $300,000 in one of Southside's new neighbhorhoods to over $1 million for a home in Deerwood Country Club. The average cost of a single family home in Southside Jacksonville is $299,400.00. With many multifamily homes and condominiums, homes for sale in the area vary widely with regard to style, architectural design, features, and price. Some of the newly constructed neighborhoods are very upscale with fabulous amenities. You can find homes over $1 million that are worth every penny. If you are on a less extravagant budget, you can easily find real estate in Southside Jacksonville for under $200,000. Renters make up only 28.32% of Southside's zip code 32246 and 39.87% of the 32224 area. Between the two zip codes of 32246 and 32224, the last reported total population in 2007 was 77,564. Southside is a very large area of town, with about 29,352 households in total. The average household income is around $57,600. Being so close to Jacksonville Beach affords many opportunities for fun and family activities. You can try Adventure Landing Jacksonville Beach, which is an amusement and water park with an exciting go-kart track. For a more relaxing and thoughtful experience, you can visit the Cummer Museum of Art & Gardens. Whatever entertainment you desire, you will not have to go far from Southside Jacksonville to get there. In the right season, you can also catch a football game with the home team - the Jacksonville Jaguars. With so much to do, residents of Southside Jacksonville are never bored! If you are one of the many Americans who are "going green" or if you just need a ride, the Jacksonville Transport Authority, or JTA, offers many solutions to get you where you need to go. There are trolleys and reliable bus service readily available in the area for those who need or want to use it. Doctors and hospitals are an important part of any community, and Southside Jacksonville, Florida is no different. From the Memorial Hospital Jacksonville to the Mayo Clinic, you will find a caring and qualified group of physicians to take care of your medical needs. There are several major employers to choose from in the Southside area that are operating in a variety of industries. Here you will find ADT Security Services, Inc., Cintas, Allstate Insurance, Coggin Automotive Group, Chrysler Financial, and more. With a growing job market that predicts nearly 26% in growth over the next ten years, Southside Jacksonville is a great place to call home. Many of the benefits to buying Southside Jacksonville Florida real estate are due to the bustling city life experience the area offers to its residents. With homes in just about anyone's price range, a great school district, a never ending list of entertainment and activities, along with a growing job market with several major employers, home buyers searching in this area will be pleasantly surprised at everything Southside Jacksonville has to offer.